MHS boys doubles team that made it to district finals doesn't compete together at state. The boys doubles tennis team of Esteban Gomez and Tony Giron, who made it to the district finals match, did not compete together. 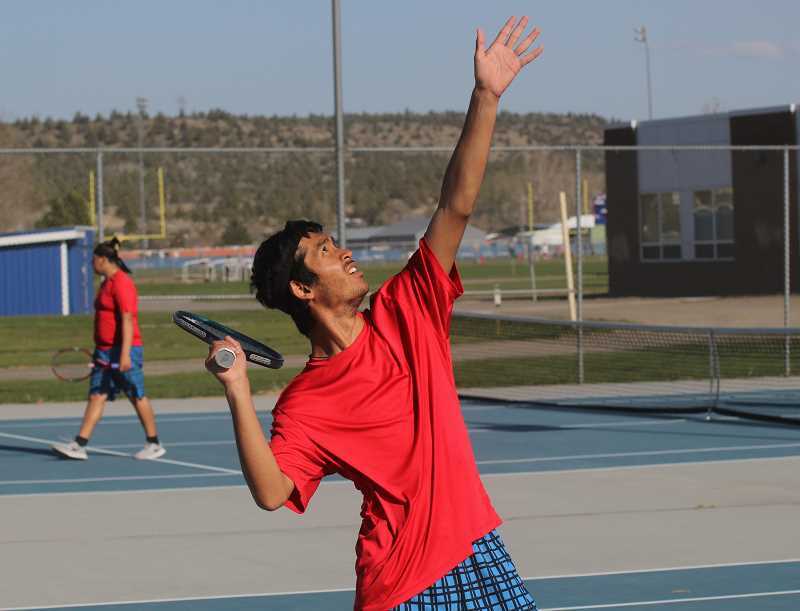 Senior Tony Sanchez played with Giron in the 4A/3A/2A/1A boys Tennis State Championships. "There was a last minute turn of events which lead to the substitution being made," said coach Margaret Kincaid. "It's unfortunate that Esteban wasn't able to participate with Tony G. at state, when they worked so hard to get that far and qualify. It was deservedly earned. It would've been nice to have seen how far they could've gone with their nemesis, the No. 1 Philomath team, who got second-place honors at state." 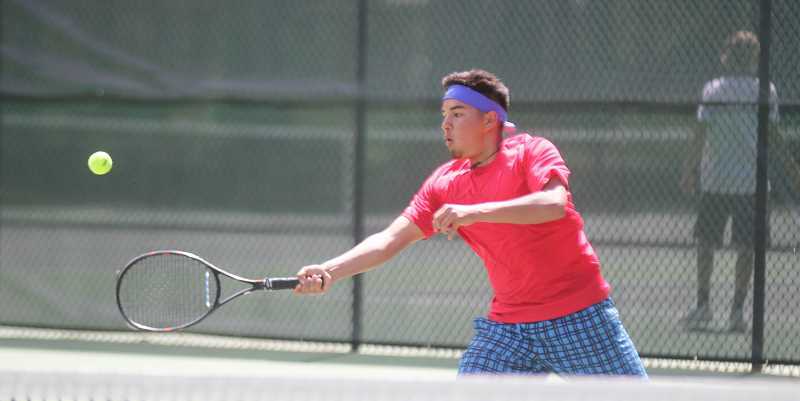 Gomez and Giron lost to Luke Haslam and Antoine Feld, of Philomath, 6-0, 6-4, in the district finals match May 10. "However, things happen, and if a change needs to be taken care of, regardless of how difficult it is, at the beginning or end of the season, it has to be done," said Kincaid. "We, meaning Giron, the assistant coach and I, knew when we chose Sanchez to come onboard, it was going to be a good fit. Sanchez has state competition experience from soccer. So, he knows what kind of pressure there is at that level." "He has this positive mindset that can't be shaken," she said. "If, at anytime, a situation gets tough, you need someone who will keep communication in an upbeat way. I believe this is what helped him and his partner, Ivan Escalante, advance to the consolation finals at districts. They had to play a tough match against the No. 1 Cascade doubles team. That match was their strongest and best playing all season." "The most important factor with a teammate, especially in doubles, is trust," Kincaid said. "If you can't trust your partner, then everything will fall apart and, that's what you get and expect from two fellow soccer teammates that can bring it to the table in a clutch, with only two days of practice before competing at state." Giron and Sanchez lost their first round match 6-0, 6-0, to Lucas Schwartz and Shiloh Day, of Oregon Episcopal, with several of their games going to deuce. The boys moved to the consolation quarterfinals match after their round one loss. The two came back from being down 5-0, making a comeback, but falling short 8-6 to Simon Mallie and Derric Mussatto, of La Grande. "Even though it was different, both Tony(s) made the best of what they could do with the circumstances that laid in front of them," said Kincaid. "They had fun, enjoyed the experience of playing against some incredible talent, and discovered they both can play out of their comfort zones and still rise to the occasion." "As a coach, you prepare your players throughout the season to step up and meet challenges head on in many situations, such as when a teammate is gone for whatever reason, and that's what Sanchez did in this case," she said. "I'm so proud of their efforts and doing as well as they did in such short notice." "In the end, I believe Tony G. and Esteban have learned a great deal from this season as individuals and partners," Kincaid said. "They now know what it really takes to have someone's back. What they both want to bring to the tennis program next year, as seniors, is anybody's guess, but it will definitely top my expectations even more."